AMMAN – His Excellency Dr. Talal Abu Ghazaleh, Chairman and founder of Talal Abu-Ghazaleh Organization, received in his office Editor in Chief of Addustour Newspaper, Mr. Mustafa Ryalat and an accompanying delegation from the Arabic daily to discuss the digital transformation of the print paper and to give more attention to youth-related concerns. During the meeting, Dr. Abu-Ghazaleh stressed the importance of the digital transformation for the purpose of attracting more readers and for wider outreach, particularly among the youth, noting that this age readers are mostly digital. Accordingly, TAG-Org will make the required arrangements to link the newspaper with a free Internet access offered by the Organization, establish a training center and knowledge station at the newspaper headquarters, offer English and computer courses in addition to other programs that develop skills of the paper’s staff. TAG-Org will also provide its expertise in the field of translation of the news into other languages, as well as exchanging economy-related news between Addustour and Talal Abu-Ghazaleh Business and Culture Radio Station to diversify the media content of the two media outlets. For his part, Mr. Ryalat highly commended Dr. Abu-Ghazaleh’s initiatives in the fields of corporate social responsibility, building capacities and supporting education noting that Dr. Abu-Ghazaleh allocates more than 50% of the Organization’s profits worldwide to serve and enhance knowledge communities. 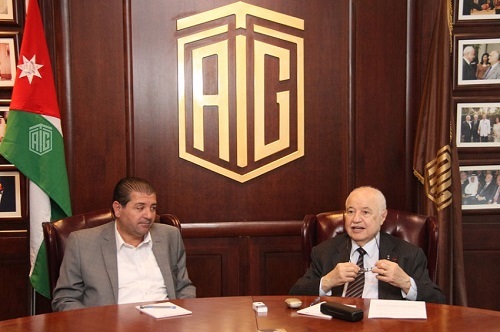 Ryalat further expressed his pride in Dr. Abu-Ghazaleh’s pioneering vision which has been translated into establishing Talal Abu-Ghazaleh University College for Innovation; the first educational institution of its kind worldwide with the aim to produce innovative graduates.